Model MSGR-20s-11 11-inch and MSGR-20s-16 16-inch Spring Truck Ramps support as much as 20 ton per pair and feature patented spring wheel assemblies. While other truck ramps require a worker to manually raise the wheels off the ground. The products are now marketed under the Donner name and are manufactured in a new color. In addition, the products’ durability has been enhanced. The company coats the 11-inch-wide MSGR-20s-11 and 16-inch-wide MSGR-20s-16 Spring Truck Ramps with a durable powder coat paint and constructs them with 3/16-inch and 1/4-inch steel, allowing pairs to support up to 20-ton capacity during maintenance. The 7-1/2-inch tall by 52-inch long ramps feature sure-grip traction pads, ensuring the equipment stays in place while driving a truck onto them. The ramps feature patented spring-wheel assemblies that improve servicing times. 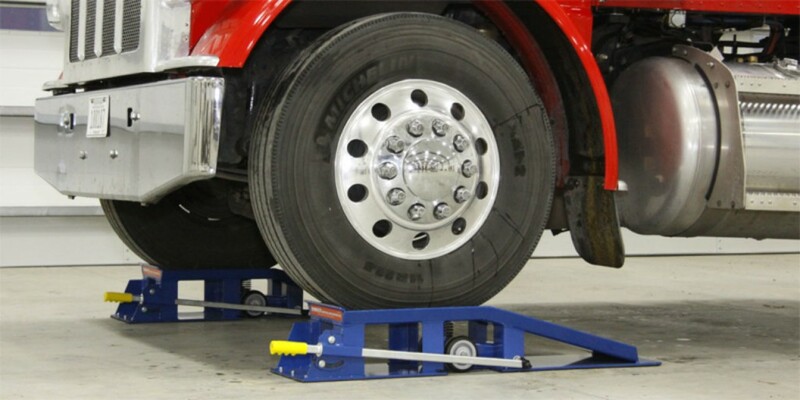 With Donner Industrial ramps, a mechanic only needs to set the ramps in front of a vehicle; the ramp’s rubber wheels rise automatically once an operator drives the vehicle onto the ramps. Other truck ramps require a worker to use separate equipment to manually raise the wheels off the ground into operating position. In addition, mechanics can easily move the ramps — which weigh from 125 to 135 pounds each — from truck to truck using the attached 36-inch retractable handle. This allows users to transport them without continually stooping down. The POP-16 Pressurized Waste Oil Caddies and PAF-16 Pressurized Antifreeze Caddies operate on shop air. This makes them more durable than products that run on electric motors, which can quickly wear out, driving up maintenance costs, downtime and lowering productivity. The caddies feature a 12 psi factory preset regulator along with two safety 15 psi pop-off valves to eliminate the risk of damage from too much pressure. Donner Industrial constructs each caddy with 14-gauge steel, coated with durable powder coat paint, and builds each only 8-1/2 inches tall, allowing them to fit easily under any truck. “These caddies offer a very clean and efficient way to service trucks,” Donner said. Donner Industrial improved the caddies’ maneuverability by replacing rigid wheels with three swivel caster wheels. The change allows the caddies to spin and move freely beneath a vehicle, which benefits mechanics working in cramped workspaces. The caddies’ 16-gallon capacity can contain a truck’s entire tank of oil or antifreeze, and the 29-inch-by-21-inch catch pan features a splashguard to keep shop floors clean. The antifreeze caddy comes with a 12-foot hose to easily return antifreeze into the top of a semi-truck radiator after maintenance. The caddy filters the antifreeze using a 100-micron tubular screen filter. The filter saves on replacement costs because unlike costly, disposable alternatives, it’s washable. The waste oil caddy comes with a shorter 8-foot hose used for disposing of oil in a waste container. In addition, each caddy can be stored vertically to maximize workspace. Donner Industrial worked with Exmark for more than 15 years, designing specialized weld fixtures for turf care products. That relationship helps the company maintain the high standards necessary to retain business from large customers in a competitive marketplace. The model POP-16 Pressurized Waste Oil Caddy runs on shop air, allowing it to avoid maintenance issues common with electric motors. The caddy can hold as much as 16 gallons and can be stored vertically to maximize workspace. The model PAF-16 Pressurized Antifreeze Caddy runs on shop air, allowing it to avoid maintenance issues common with electric motors. The caddy can hold as much as 16 gallons and features a 12-foot hose. The Donner model MSGR-20s-11 11-inch and MSGR-20s-16 16-inch Spring Truck Ramps support as much as 20 ton per pair and feature a 36-inch retractable handle, allowing a mechanic to easily move them across a shop floor without stooping.